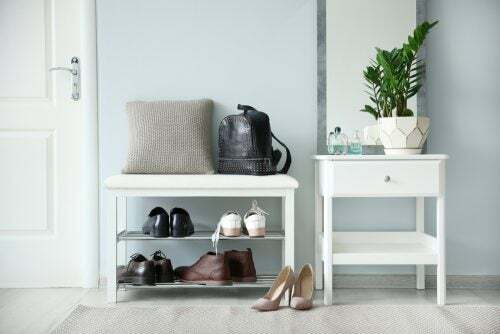 Home » Corridor » What Should a Well-Furnished Entryway Have? What Should a Well-Furnished Entryway Have? Learn all about the basic elements of a well-furnished entryway so that you can decorate yours perfectly. In this article, we want to give you some tips and ideas for a well-furnished entryway. Don’t forget about this space. The way it’s decorated will influence everyone’s perception of the entire house when they first enter your home. So, the entryway is kind of like a letter of introduction for our guests since it’s the first thing they’ll see when entering the house. Obviously, you have to take the amount of space you have into account. This will affect how we set up the furniture and decorative pieces. Regardless of how much space you have, there’s a series of common guidelines that we can discuss. For example, maximizing natural light and not filling the area with too much stuff. There’s also specific furniture and basic accessories that you can use to decorate your entryway. If you have enough space, you can use all of them. On the other hand, if you don’t have that much space, you can make some pieces work with what you have. 2. Shelf type: this is just a thin, narrow board on two supports, one at each end. You have to be careful to not put too much weight on the shelf because it could bend. Although we use console tables for their functionality, you should also look for one that’s decorative. One last idea: a mirror would look great with it. Unfortunately, you won’t be able to use one in smaller entryways. But, if you have a larger space to work with, be sure to include a bench. You can use cushions and pillows to make them more comfortable. Try out some plaid patterns to make it stylish. Keep in mind, this isn’t just a place to sit down and take your shoes off or somewhere to leave your backpack. It can also be an extra storage space. 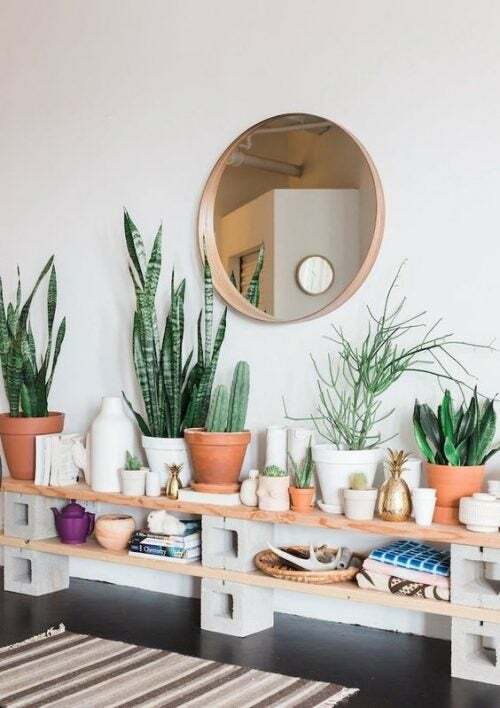 By placing one or two baskets or drawers under the bench, you’ll give yourself more storage. You can even put small doors on it so that you can’t see what’s underneath. Another great idea is to place a carpet in front of the bench. This will be extremely useful in your day to day life. The size rack you choose will depend on the size of your entryway. You can get the typical standing rack or a basic one that sticks directly onto the wall. And, if you have a lot of free space, you can opt for a clothes rack. These have longer bars and may or may not have wheels on the bottom so they can easily be moved. They look like the clothes racks you see in movies, in the theater dressing rooms or movie studios. If you want, you can even make one at home to achieve a well-furnished entryway. Once again, we’re going to tell you about the advantages of having mirrors in your home. First, they make a space appear wider. They also make the room brighter, which is always a good idea. If you like the DIY trend, you may want to try making a frame for your mirror. It’s a very creative and original task. Just be sure to keep in mind the decorative style of your entryway, and the rest of the house, so that your mirror matches. Although they often go unnoticed, umbrella stands are very common in entryways. They’re definitely a great piece for the room and they barely take up any space. You have to take its dimensions into account, especially its height. Also, you can even make one yourself reusing old floor vases. This will give them a new and practical use. There are many different types, so it won’t be hard to find one that matches the decorative style of the entryway. We hope these ideas will help you create a well-furnished entryway. Although these rooms are often narrow and poorly lit, that doesn’t mean you can’t turn it into a practical, yet beautiful space. Finally, we want to leave you with one last piece of advice: less is more. That’s why it’s important that you don’t overload the space. Minimalism isn’t just a decorative style, it can also be a lifestyle. Apply it to your life and you’ll see an improvement in all areas.